I am unable to drag items to put them on the background menu. The item screen takes up the entire bottom screen and I believe the DS version left some room around it. This Is what you were inquiring about, correct? Edit- Just checked the DS version and it was the lower left corner. It does not work on New Leaf. Question. I remember in the first Animal Crossing game, you could have Nook "mail" items to other players by using a code. You'd tell him their name and town, and he'd give you a code to give the player to type in at their Nook shop. Is this still in the game, or are items only traded in-person during multiplayer meet-ups? Just curious. You can send friends mail through the internet. Say someones birthday is today and they are busy just pop a gift in a letter and send it! There is also now wrapping paper to wrap gifts F.Y.I. i'm drowsy so my first split-second thought looking at that image was "why do they have a borg mask in Animal Crossing" thinking it was some weird Star Trek cross-promotion in Japan. A few seconds later "ugh its MIDNA." Cringed a bit in the moment for not being my first guess. I loved the Nintendo items in the previous games. I cannot wait to collect all the new ones in this game. Technically just six days!!! Though I have mine coming from Amazon. Normally I'd have bought via GameStop for a title like this but my girlfriend is really excited and she's also getting it via Amazon so I figured I'd be patient and wait just like her. It's rough!! I got my new SD card in the mail, got everything moved over, and I'm ready to go! I think my sister will be getting her copy later in June, but that's alright. I'll just show up as the welcome wagon with a veritable fruit salad in my pants. I'ma have my house totally paid off by the time you start your game, and my town will be exponentially more awesome than yours. I'll still come visit Dr. Fink in Latesville though. I plan to buy my copy on Sunday morning digitally. Can't wait! Do we know how much space it will take up on the SD card? I have my ACNL 3Ds xl paid off. I also have a boxed copy of animal crossing (for my girlfriend) paid off. 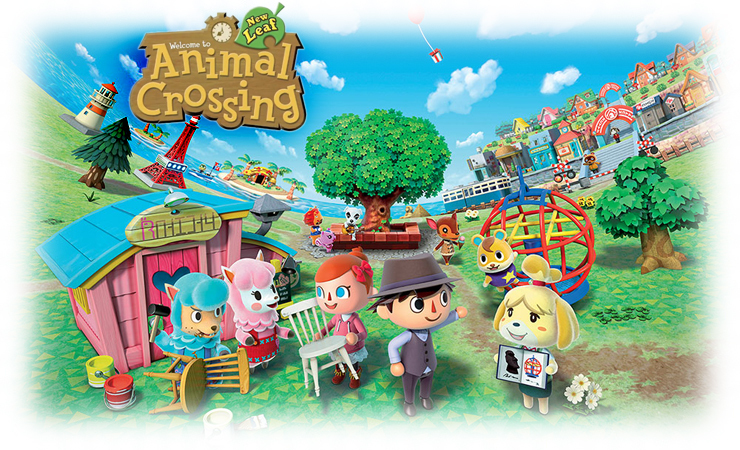 Sunday morning at 11am is when I can pick it up and be in animal crossing bliss all day! People are saying either 6k blocks or 8k blocks. Best to have 1 GB available, I think. It's huge! Apparently the IGN review went up by accident but the score was a 9.6. Cool to hear that early though. I don't hold IGN too high of regard these days but when they say something's good, it's always nice to hear. I think the embargo has been lifted because they're going up everywhere. Looks like a lot of 9's. Yeah I saw that Audrey Drake's review was still up on IGN. Some british reviewer mentioned an embargo she had to wait on until this afternoon so I agree, it must have been lifted. Awesome scores all around. Though a lot of people are bitching this received a better score than Bioshock Infinite or Skyrim. Do people realize every review has it's own distinct contexts? Geez. Yeah lots of reviews. Seems like a step up from the last game! To break it down for people even sooner and quicker, here's the reviews as they've trickled in. Organized by score and alphabetically within that. Looks promising. I watched GameXplain's video review (which they didn't score yet since they haven't done everything that they wanted to do) and the reviewer said he felt like this was a breath of fresh air, and while he gave up on Wild World (and completely skipped City Folk) after three weeks and he doesn't see himself giving up on New Leaf in the near future. That's the kind of game I need. This is amazing! How well received this game has become! I can't wait to play it. I may need to do some trade ins.